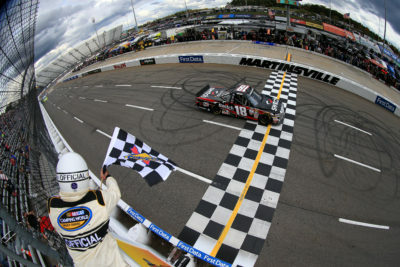 Credit: 352613Photo by Chris Trotman/Getty Images Noah Gragson, driver of the #18 Switch Toyota, takes the checkered flag to win the NASCAR Camping World Truck Series Texas Roadhouse 200 at Martinsville Speedway on October 28, 2017 in Martinsville, Virginia. Crafton Ideal Doors/Menards Toyota, started from 2nd place posted his 19th Top 10 finish in 32 races at Martinsville Speedway. It is his 14th Top 10 finish in 2017. 3rd Place Truck 21 Johnny Sauter (P) ISMConnect Chevrolet, started from 4th place posted his 11th Top 10 finish in 20 races at Martinsville Speedway. 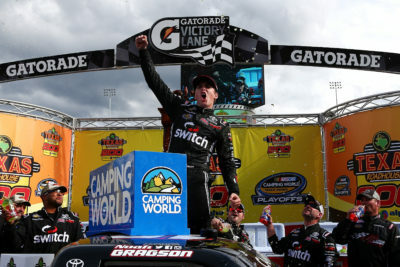 Credit: 352614Photo by Sarah Crabill/Getty Images Noah Gragson, driver of the #18 Switch Toyota, climbs the frontstretch fence after winning the NASCAR Camping World Truck Series Texas Roadhouse 200 at Martinsville Speedway on October 28, 2017 in Martinsville, Virginia. 4th Place Truck 51 Harrison Burton DEX Imaging Toyota, started from 10th place followed by 5th place Truck 46 Todd Gilliland Pedigree Toyota, started from 13th place. 6th Place Truck 52 Stewart Friesen We Build America Chevrolet, started from 11th place followed by 7th place Truck 33 Kaz Grala ChargeCords.com Chevrolet, started from 8th place. 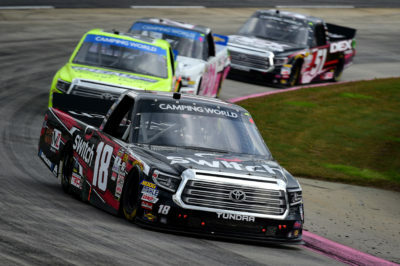 8th Place Truck 4 Christopher Bell (P) JBL Toyota, started from 15th place followed by 9th place Truck 27 Ben Rhodes (P) Safelite Auto Glass Toyota, started from 3rd place. Lastly in the Top 10 was Truck 19 Austin Cindric Fitzgerald Glider Kits Ford, in 10th place, started from 6th place. Christopher Bell leads the point standings by 3 points over Johnny Sauter. 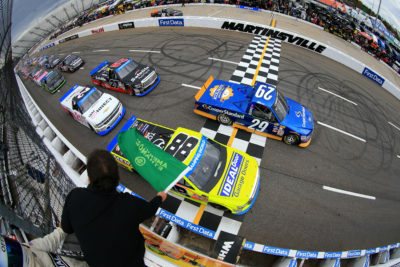 Credit: 352612Photo by Chris Trotman/Getty Images Chase Briscoe, driver of the #29 Cooper Standard Ford, and Matt Crafton, driver of the #88 Ideal Doors/Menards Toyota, lead the field to the green flag to start the NASCAR Camping World Truck Series Texas Roadhouse 200 at Martinsville Speedway on October 28, 2017 in Martinsville, Virginia. Truck 24 Justin Haley Zeality Chevrolet and Truck 29 Chase Briscoe Cooper Standard Ford Crash in Turn 1. 6th Caution on lap 184 for Truck 50 Bayley Currey Preferred Industrial Contractors Chevrolet Spin in Turn 2.
Credit: 352618Photo by Jared C. Tilton/Getty Images Noah Gragson, driver of the #18 Switch Toyota, leads a pack of trucks during the NASCAR Camping World Truck Series Texas Roadhouse 200 at Martinsville Speedway on October 28, 2017 in Martinsville, Virginia. 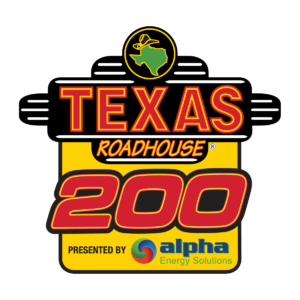 The race had 6 Lead Changes among 5 drivers: C. Briscoe # 1-39; M. Crafton (P) 40-71; J. Sauter (P) 72-104; M. Crafton (P) 105; C. Bell (P) 106-121; M. Crafton (P) 122-190; N. Gragson # 191-200.
Credit: 352615Photo by Sarah Crabill/Getty Images Noah Gragson, driver of the #18 Switch Toyota, celebrates in Victory Lane after winning the NASCAR Camping World Truck Series Texas Roadhouse 200 at Martinsville Speedway on October 28, 2017 in Martinsville, Virginia. 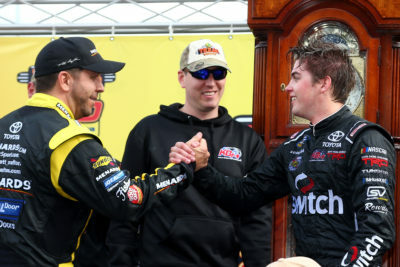 Credit: 352616Photo by Sarah Crabill/Getty Images Matt Crafton(L), driver of the #88 Ideal Doors/Menards Toyota, congratulates Noah Gragson(R), driver of the #18 Switch Toyota, on winning the NASCAR Camping World Truck Series Texas Roadhouse 200 at Martinsville Speedway on October 28, 2017 in Martinsville, Virginia. Race Comments: Prior to the green flag, the following trucks dropped to the rear of the field under penalty: No. 15 (missed drivers meeting) and No. 50 (pitting before the green flag). Failed to Qualify: (1) 57 Mike Senica. Caution Flags: 6 for 45 laps. Lead Changes: 6 among 5 drivers. Time of Race: 01 Hrs, 32 Mins, 55 Secs. Average Speed: 67.932 MPH. Margin of Victory: 1.486 Seconds. Duralast GT Brakes ?Brake in the Race Award? – Stage 1: Matt Crafton, #88 Stage 1. Duralast GT Brakes ?Brake in the Race Award? 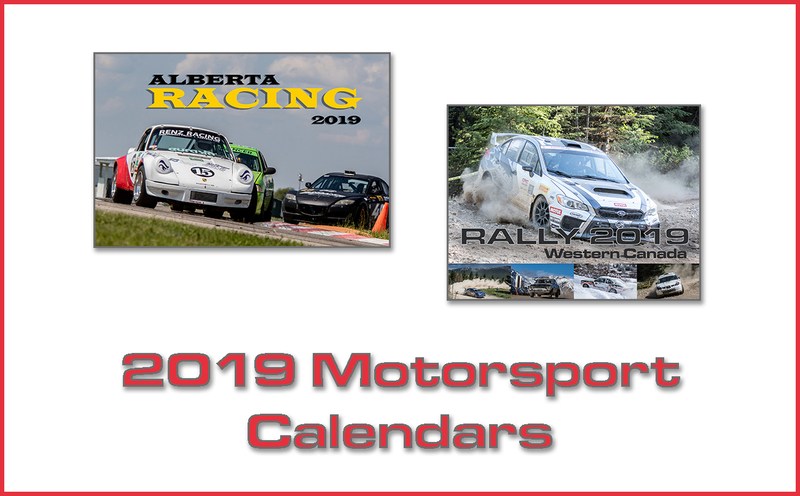 – Stage 2: Johnny Sauter, #21 Stage 2. Keystone Light Pole Award: Chase Briscoe, #29 95.762 mph. Mahle Clevite Engine Builder of the Race: Triad Racing Technologies (TRT), #88. Mobil 1 Driver of the Race: Noah Gragson, #18. Sunoco Rookie of the Race: Noah Gragson, #18.